in line with all applicable laws and regulations. This manual may qualify the location of a component as left-hand side or right-hand side. The side is determined when facing forward in the seat. Upon starting your vehicle, you may see some of these indicators light up as a routine check to verify functionality. These lights may simply be indicating a vehicle control setting, e.g., Front Fog Lamps On. If certain indicators were to remain illuminated while your engine is running, however, they could be alerting you to a serious condition. 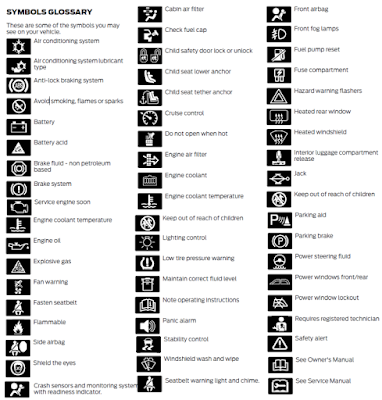 To take the guesswork out of interpreting these signals, scroll down to our visual glossary, which displays the full array of Ford Escape warning lamp and indicator symbols, and defines their function. 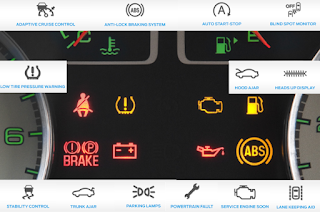 Illuminates to alert you when your engine is shutting down; a corresponding message may also be displayed. Driving your vehicle with a warning lamp on is dangerous. A significant decrease in braking performance may occur. It could take you longer to stop your vehicle. Have your vehicle checked by your authorized dealer immediately. Driving extended distances with the parking brake engaged can cause brake failure and the risk of personal injury. lluminates when Cruise Control feature is turned on. If illuminated while engine is running or you’re driving, a malfunction is indicated. Stop your vehicle as soon as it is safe to do so, and switch the engine off. Check the engine oil level. 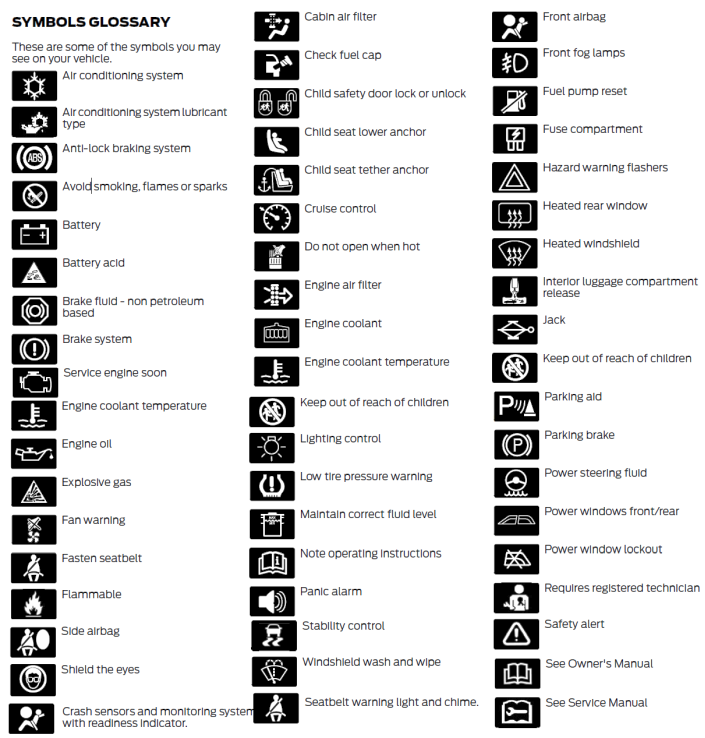 If you find that your engine oil is at the appropriate level, yet the warning lamp remains lit, do not resume driving. Have the system checked by your authorized dealer immediately. Lights up when your tire pressure is low. This indicator also illuminates momentarily when you switch on the ignition, showing that the lamp is functional. If the indicator remains lit while the engine is running or you’re driving, check your tire pressure as soon as possible. If indicator does not illuminate when you switch the ignition on - or begins to flash at any time - have the system checked by your authorized dealer. Diagnostics system (OBD) has detected a malfunction of the vehicle emissions control system. Contact your authorized dealer as soon as possible. If indicator light is blinking, an engine misfire may be occurring, which could damage your catalytic converter. Drive in a moderate fashion (avoid heavy acceleration and deceleration), and have your vehicle serviced immediately. Under engine misfire conditions, excessive exhaust temperatures could damage the catalytic converter, the fuel system, interior floor coverings or other vehicle components, possibly causing a fire. Have an authorized dealer service your vehicle immediately. The Service Engine Soon indicator light illuminates when the ignition is first turned on (prior to engine start) in order to test the bulb, as well as indicate whether the vehicle is ready for Inspection / Maintenance (I/M) testing. Normally, the Service Engine Soon light will stay on until the engine is cranked, then turn itself off if no malfunctions are present. 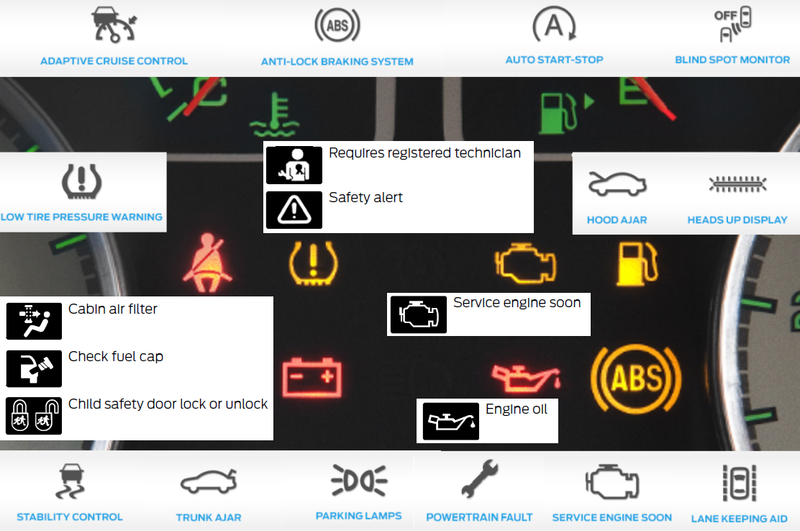 However, if after 15 seconds this light blinks eight times, it means that the vehicle is not ready for I/M testing. Lights up when the system is active. If indicator remains illuminated or does not light up when you switch the ignition on, a malfunction is indicated. During a malfunction, the system will switch off. Have the system checked by your authorized dealer immediately.